Alto saxophonist Lee Konitz, winner of the 2009 National Endowment for the Arts Jazz Master Award—our nation's highest award in jazz, will perform in concert with the award-winning Whitworth Jazz Ensemble on Saturday, Nov. 7, at 8 p.m. at the Fox Theater, in downtown Spokane. Admission is $17. For tickets, call TicketsWest at (509) 325-7328 or purchase online at http://www.ticketswest.com/. Tickets also can be purchased at the Fox Theater's box office. Konitz will conduct a free jazz clinic for Whitworth students, Spokane-area students, and the general public on Friday, Nov. 6, at 5:15 p.m. in the Music Building's Recital Hall. For more information about the concert or clinic, please call (509) 777-3280. "This fall, Spokane will have hosted two of the most important living jazz musicians—Dave Brubeck, who performed at the Fox in September, and now Lee Konitz," says Dan Keberle, professor of music and director of jazz studies and the jazz ensemble at Whitworth. "Not only will the Whitworth jazz students learn from hearing Konitz perform, but they also will have the rare opportunity to spend time with a jazz musician who has been playing with all of the jazz greats since 1945. Konitz is a walking jazz history book, as well as a supreme musician." The concert will be part of a weekend of events, including a reunion for alumni of the jazz program, celebrating the 20th anniversary of jazz studies at Whitworth. To register and find a complete listing of jazz reunion events taking place Nov. 6-8, please visit http://www.whitworth.edu/Alumni/Reunions/Jazz/Index.htm. For more information, please call (509) 777-4250. During the concert at the Fox, Konitz, who helped launch the "Cool Jazz" movement, will play expanded jazz band arrangements of tunes from the landmark jazz album, Birth of the Cool, which he recorded with Miles Davis and Gerry Mulligan, et al., in 1949 and 1950. The album represented a major development in post-bebop jazz and was significant to the history of cool jazz, which is a style of jazz music that rose to prominence after World War II, when predominantly white musicians from California mixed with mostly black bebop musicians from New York to form a smooth, composed sound that include improvisation. In his youth, Konitz studied alto saxophone with several teachers in Chicago. As a teen in the early 1940s, his jazz style began to mature as he studied under noted pianist Lennie Tristano. Their recordings together include the 1949 releases Intuition and Digression, which represented the first free improvised recorded music. After working with Miles Davis on Birth of the Cool, Konitz went on to play with Gerry Mulligan and Chet Baker's prominent band and then in Stan Kenton's big band. Since then, he has mainly led his own small groups and toured abroad. In the 1960s, he took a break from the music business but continued to cultivate his unique sound; during that time he worked with musicians including Paul Bley, Martial Solal, Charlie Haden and Brad Mehldau. He also worked as a private teacher, conducting lessons by tape with students worldwide. In the mid-1970s, he toured Europe with Warne Marsh, and in the 1980s he formed his own nine-man group and performed regularly. In 1992, Konitz won the prestigious Danish JAZZPAR Prize. Over the past decade, his recordings have included Lee Konitz & The Axis String Quartet: Plays French Impressionist Music of the 21st Century (Palmetto, 2000) and One Day with Lee (2004), for which he joined with the Mark Masters Ensemble. Other releases include Inventions, featuring the Spring String Quartet (Omnitone, 2006); New Nonet (Omnitone, 2006); and Portology, featuring Orquestra Jass de Matosinhos (Omnitone, 2007). His newest CD, released earlier this year, is Parallels (Chesky Records). Konitz represents the most prominent guest artist in a long list of internationally-renowned jazz musicians who have performed with the Whitworth Jazz Ensemble over the years. These artists have included Terence Blanchard, Bob Mintzer, Joe Lovano, Slide Hampton, Nicholas Payton, Kenny Garrett, Phil Woods and Gene Harris. 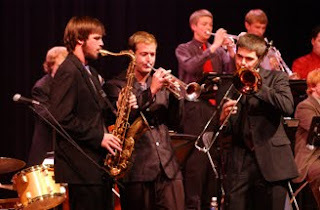 The Whitworth Jazz Ensemble performed at the 2008 Washington Music Educators All State Conference and won first place at the 2008 Lionel Hampton Jazz Festival; the ensemble has won first place seven times since 1994. The 18-piece ensemble performs several concerts each year on campus, as well as at jazz festivals, in public schools, at civic events, and on annual tours throughout the United States. In January 2008 the ensemble traveled for the seventh time to Rome, Italy, for several performances with leading Italian jazz artists. In January 2006 the ensemble traveled to Sao Paolo and Salvador, Brazil, for concerts at two music festivals. In 2004 they traveled to Rome, followed by a performance trip to Hawaii. Other performance residencies in previous years have included trips to Havana, Cuba, two trips to Munich, five others to Rome, and nine performances in Australia, at the Melbourne International Jazz Festival and in the surrounding area. This January, they will embark on a tour of New York City and New Orleans. The ensemble has produced eight CDs; the most recent is Travelin' Light, released in 2008. For more information on the Whitworth Jazz Ensemble, please visit www.whitworth.edu/jazz.